"I still believe the best currency is gold and silver, and this is not the perception of most people. They believe gold and silver are speculative investments," Faber added. INTERNATIONAL. Marc Faber the Swiss fund manager and Gloom Boom & Doom editor predicted the value of the dollar in the long term will be zero and advised investors to become "their own central banks and gradually accumulate gold reserves as a currency". Speaking early on Monday to CNBC Asia, Faber said: "We are in a contest for the ugliest currency". Most investors have at least 70%-80% of their money in US Dollars, he said, adding that occasionally the money speculators may be heavily into the euro and negative about the dollar but "there is a huge overhang of US Dollars globally. If people could sell their dollars and move into something they believed in, they would do it". In a reply to a question from a viewer, Faber said investors "should be their own central banks and gradually accumulate gold reserves as a currency", rather than speculating in gold. He recommended holding physical bullion over other gold assets and advised against holding gold assets in the US because of the risk of "expropriation" by US authorities, as they did in the early 1930s. The price of spot gold jumped closer to US$1500 today, reaching a new all-time high of US$1497 per ounce. Fear of inflation...the high oil price...extreme financial difficulties [for some] Eurozone nations...the US debt-crisis...problems in the Arab world...and the situation in Japan...There are more than sufficient reasons why the gold price further extended its gains to a new all-time high," writes Wolfgang Wrzesniok-Rossbach in his latest Precious Metals Weekly at German refining group Heraeus. "The moderate interest-rate hike in Europe has not had the ability to change the trend, nor has the relatively restrained demand for bars and coins, observed not only in Germany but also in Asia." On the direction of the US Dollar, he told CNBC the greenback may see a temporary rally but he maintained his long term prediction: "The value of the US Dollar will be precisely its intrinsic value, namely zero, precisely zero". The Gloom Boom & Doom editor has not changed his stance towards gold. 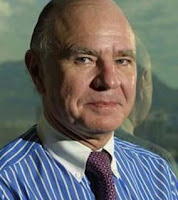 In a March 2009 interview he advised to "buy every month a little bit and become your own central bank because you can't trust central banks anymore to act responsibly and maintain the function of paper money as a store for value. So, you want your own reserve". In a discussion about the US deficit in today's CNBC appearance, Faber said he didn't think it was possible to "reduce the deficit meaningfully unless the US increased taxation significantly and cut spending meaningfully". He expects "the US government to raise the debt ceiling, but the deficit will stay around US$1.5 trillion for the foreseeable future" because of politics. The US has the Republicans on one side and the Democrats on the other and I don't think they will compromise, he said.